I expand on my previous post about how pitchers work the corners to look at whether the effect remains when we control for ball-strike count. It does. As in my previous post, it appears the sweet spot for pitchers is about 6 inches off the plate (as seen above), although the advantage seems to be closer to one free strike out of ten pitches called, rather than the one-in-sixteen I originally concluded. More strikingly, there's a near-equal and opposite effect when pitchers consistently throw 5-6 in. 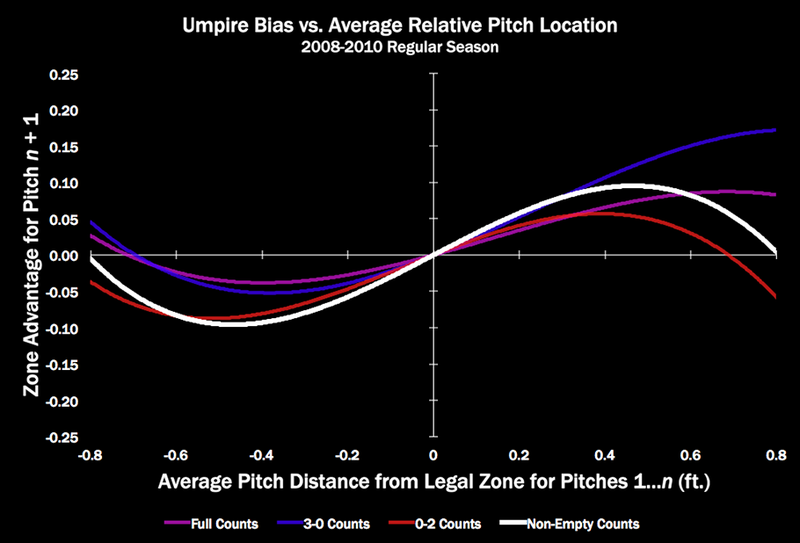 inside the boundaries of the legal zone, costing the pitcher an extra ball for every ten pitches called.